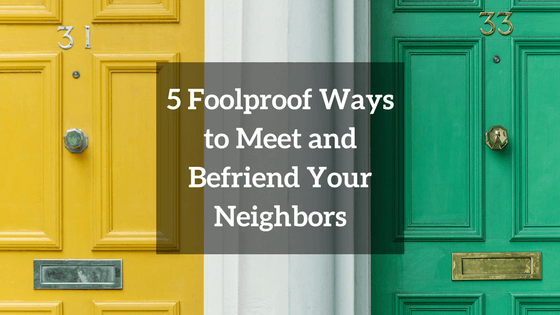 5 Foolproof Ways to Meet and Befriend Your Neighbors! Meeting new people can be intimidating, especially if you’ve recently moved to a new apartment or neighborhood. If you’re a shy person, it can be even harder. But having positive and healthy relationships with your neighbors can be very beneficial. Whether you’re the newcomer or have new neighbors on the block, it’s important to know who lives nearby. To make your home or apartment more enjoyable, read on to learn five ways you can meet and befriend your neighbors. If you’re anxious, reserved, or shy, introducing yourself to someone new can be nerve-wracking. Rather than make a formal introduction, opt for a simple “hi” or “hello” in passing. A friendly greeting is a great way to break the ice, and it opens the door to have a more in-depth conversation at a later date. For those who have no trouble engaging in chit-chat, you may want to greet your new neighbors with an enthusiastic “welcome to the neighborhood!” They’ll appreciate you reaching out to them, and it lets them know you’ll be a friendly face. If you’d rather show your sincerity than vocalize it, you can go a step further by cooking or baking a welcome gift. Everyone loves a welcome basket of chocolate chip cookies or a homemade apple pie. Don’t worry if you’re not a great cook or a skilled baker. You can pick up a small box of pastries from your favorite local bakery as a way of welcoming them. If you’re the one that has just moved to a new neighborhood, make a point to be friendly and courteous to your new neighbors. Just because you’re the newcomer doesn’t mean you can’t start the conversation. After all, real friendships are a two-way street. Once you’ve made contact with neighbors who seem friendly in return, it’s time to socialize. Ask a few of your neighbors if they’d like to join you for a cup of coffee or a happy hour after work. Pick a local spot that’s accessible for everyone. If you live in the same building or on the same block, meet somewhere in the neighborhood for convenience. Socializing with neighbors is a great way to build friendships and meet new people. If you’re the new neighbor, try inviting one or two people out for a drink. To widen your social circle, even more, encourage them to bring a few more friends. A foolproof way to meet new people is to walk around the neighborhood with your dog. Think about your own behavior. As a dog lover or a dog owner, do you have a hard time resisting the temptation to pet or greet another puppy? Most dog lovers do. By spending time in a local dog park or taking your pet to a dog-friendly restaurant, you’re certain to meet fellow dog lovers like you. Dogs make it easy to break the ice and strike up a conversation. For those who find it difficult to start conversation, dogs can make the process easy. The next time you’re walking your dog, take the time to stop and chat with other neighbors and their dogs. If your dogs get along, you may even be able to plan a doggie play date. A great doggie date may lead to a friendship between you and the other dog’s owner. It doesn’t matter if you’re new to the neighborhood or have lived there for years. Throwing an apartment warming party is a great way to meet neighbors you’ve never known and introduce yourself to new ones living nearby. Getting the community together may not inspire lifelong friendships, but it will help you get to know each other better. If you’re the newcomer to the building or neighborhood, it’s a great idea to host a party in your own apartment. Invite a few existing friends from your old neighborhood if you want to ensure that people will show up. But the real purpose should be to meet new people. Depending on how many guests your apartment can hold, you may want to hang a few fliers around your building. Prefer a more intimate gathering? Slip a handful of invites under a few neighbors’ doors. Apartment warming parties are easy to throw. You don’t need to prepare a full sit-down meal either. Delicious appetizers, snacks, and drinks are usually all you need to create a social atmosphere. It can be easier to make friends if you surround yourself with like-minded people. To meet your neighbors or find some new pals, find a volunteer opportunity in your community. Animal shelters, hospitals, and local chapters of national charities are great places to give back. But they’re also great places to make friends dedicated to a cause you care about. You can form meaningful connections by spending time with people who are passionate about the same causes as you. If you want to give something and get something in return, look for a volunteer opportunity in your community. Meeting new people can seem overwhelming, but it doesn’t have to be intimidating. If you know how to do it, it won’t be difficult at all. Start by introducing yourself and be willing to engage in conversation. Suggest a social gathering at a local happy hour or coffee shop. If you have a dog, use that as a way to meet other dog lovers. When you feel ready to be more social or active, host an apartment warming party for new neighbors. Volunteer as a way of giving back to the community and meeting new people that you can connect with. You may have to step out of your comfort zone to start up a great conversation, but if you do it in the right setting it will be easier than you think. Park Place is Fountain Hills’ newest apartment community. Located in the beautiful downtown area, Park Place offers residents a luxury option in town with excellent walkability.